Combine herb mixture in small bowl, set aside. 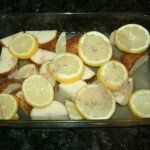 Place potatoes in bottom of baking dish, put sliced lemon on top. Next mix water in with the herbs. Pour into pan. Make sure there is enough water to cover the bottom of pan. 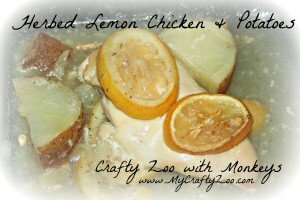 Place chicken on top of potatoes/lemon. HaHa, yo had me at potatoes. I love them.? 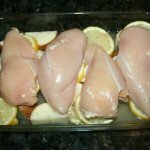 This sounds really good – I’m always looking for new chicken recipes!